At the rally, Griffin is approached by Dan Choi, a gay Army officer and radical opponent to DADT, who asks her if he can come up onstage with her. Once there, he takes the microphone and implores the crowd to walk with him a few blocks to the White House. “I am in uniform, I am still fighting, I am still speaking out, I am still serving, and I am still gay,” Choi declares. “Will you all here join me? Kathy will you go with me?” he asks Griffin, whose face freezes in PR horror. Griffin answers yes, but she means no. She chooses to stay behind and deliver the crowd a text message she says has just been sent from Cher, which she dangles before everyone like it’s gay catnip. 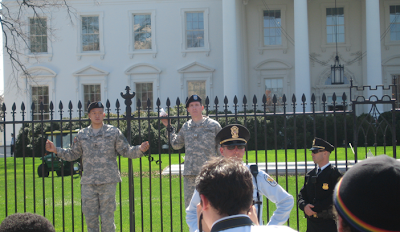 Choi marches over to the White House, where he and another soldier handcuff themselves to the Pennsylvania Avenue fence and are promptly arrested. What? Kathy Griffin is suddenly afraid to look ridiculous? Lieut. 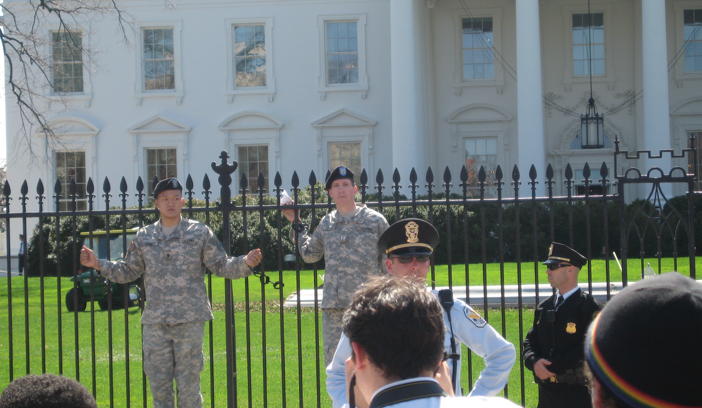 Dan choi heads to white house to fight dadt. Griffin and HRC’s Solmonese stay for photo ops. Welcome to gay dc. Tonight, Kathy Griffin has some laughs about gay issues. HRC will get some face time on Bravo. Tomorrow, Dan Choi and Jim Pietrangelo will be in court to defend themselves for fighting for equality.